Colorful Seasons is a lovely set and I made a card today with some of the floral twig stamps. I did them in red as I thought that they looked a little festive - what do you think? 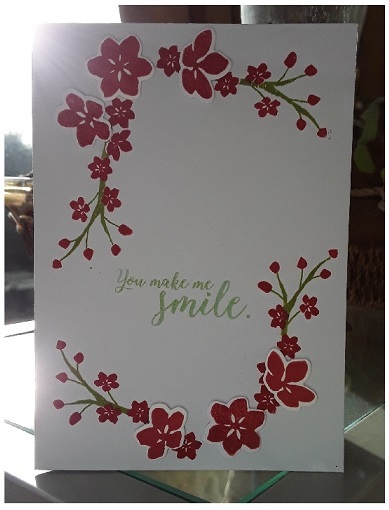 It was a very quick and simple card to make - the green sprig was stamped four times in the corners of the card. The tiny flowers were stamped over the sprigs - they fit perfectly onto them - and then the larger flowers were stamped and die cut using the Seasonal Layers Thinlits. They were attached using dimensionals.